The American Veterinary Medical Association (AVMA) used their 2017 national conference to present CVM Executive Director Dr. Kit Flowers with one of three President’s Awards for the year. This award honors veterinary professionals whose contributions have made a positive lasting impression on veterinary medicine and improved the health and welfare of people and animals. Veterinarians from all over the globe converged on Indianapolis for this year’s AVMA conference, where over 7,000 attendees experienced CE sessions, interactive labs and hands-on learning workshops. Many also had the chance to honor their colleagues at the President’s Reception. 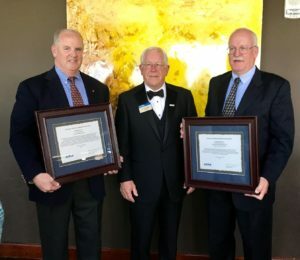 Dr. Tom Meyer, AVMA President, presented this year’s President Awards to Dr. Flowers, along with Dr. Richard DeBowes and Kathy Ruby, Ph.D.
Congratulations Kit and the entire CVM team!